Price: $1,16995 Free shipping Today! 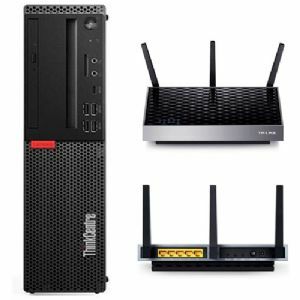 Get uncompromising performance from the rugged and powerful Lenovo ThinkCentre M920 SFF Desktop PC that can handle tough treatment, including dusty environments. Powered by 8th Gen Intel Core i7-8700 Six-core processor with a speed of 3.20GHz that can maximize your ability to work within a responsive, progressive system function. Aided with a 32GB DDR4 memory which enhances the system's multitasking operations so you can gain more productivity and run complex applications easily. Together with the included 256GB M.2 PCIe Opal SSD storage capacity which does not only accommodate your valuable data and files but also provides faster system boot-ups which in turn can improve your overall system performance. No matter your port needs, this desktop has you covered with support for a total of nine USB ports including USB-C, two DisplayPort, one VGA, and LAN connections. It is a small form factor that is perfect for space-conscious users. Additionally, it runs with the Windows 10 Pro operating system to provide a user-friendly interface and innovative features for optimum system performance. Bundled with TP-LINK RE580D Wireless Network Extender with three external, dual-band antennas and high-powered amplifiers, it can establish a stable wireless connection to any Wi-Fi router and augment the network's coverage. The powerful processor provides great Wi-Fi performance, keeping your smartphones and tablets connected as you move around your home. So, what are you waiting for? Go ahead and get your business benefited through Lenovo ThinkCentre M920 SFF Desktop PC.